With the new season only a day away, I am sure you will have been busy making sure that your equipment is in good order, lines ready, flies bought, waders fixed and ready to get out there in search of that magnificent prize, your first springer of the 2014 season! Spring fishing although not for the faint hearted, this month can offer the salmon angler a good chance of catching a ‘Tweed Springer’. 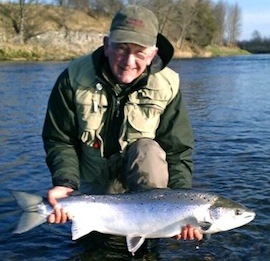 The Tweed is currently offering some of the best priced early Spring fishing available in Scotland. FishTweed’s Tom Carter recommends the following beats for February: West Learmouth, Upper North Wark, Rutherford, Upper Hendersyde, Lower Birgham, Dryburgh – Find Fishing . If you are new to the river and need some help in finding fishing, call the team on 01573 470612, they will be happy to help you find everything you will need to have a fantastic trip to the Scottish Borders.